(MIRAMAR BEACH, Fla.) February 14, 2017 – Purses with a Purpose, the annual sale and auction of new and gently used handbags to benefit Shelter House, returns to Grand Boulevard March 24-25, 2017. Whether you favor a tote, satchel, clutch or hobo, you can find it at Purses with a Purpose. 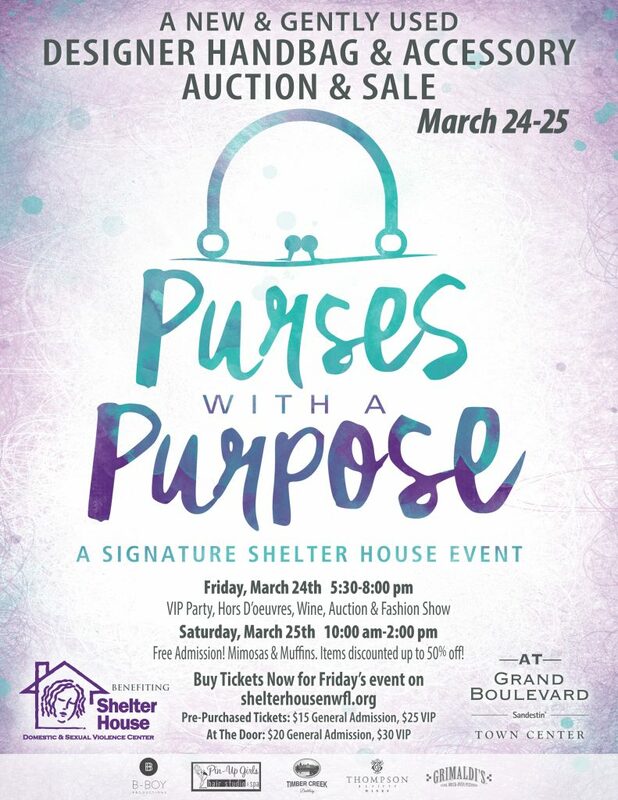 This signature Shelter House event, now in its seventh year, has become a must-attend annual shopping experience for ladies across the Emerald Coast. Shoppers at Purses with a Purpose have the opportunity to select from hundreds of new and gently used purses up for sale or auction. Handbags from designers including Michael Kors, Kate Spade, Coach and more will be available for purchase. This year’s event kicks off with an opening party on Friday, March 24 in the corner storefront next to Altar’d State at Grand Boulevard at Sandestin. Attendees will enjoy appetizers from Grimaldi’s, refreshments by Timber Creek Distillery in the lounge and wines donated by Mike and Valerie Thompson of Thompson 31Fifty Wines. B-Boy Productions will provide a DJ and photo booth. A purse fashion show featuring hair and makeup by Pin Up Girls Hair Studio will top off the evening. Doors open at 6 p.m. for general admission. VIP tickets get you in at 5:30 p.m. for first pick of the purses and a specialty cocktail. General admission tickets are $15, and VIP tickets are $25 in advance. Tickets purchased at the door are $20 for general admission and $30 for VIP. Purses with a Purpose reopens on Saturday, March 25 from 10 a.m. to 2 p.m. with deep discounts on remaining merchandise, plus muffins, mimosas and free admission. For more information and to purchase advance tickets, visit www.shelterhousenwfl.org. Since its inception, Purses with a Purpose has raised more than $73,000 to support Shelter House’s critical services for domestic and sexual violence survivors. Shelter House accepts donations of new and gently used handbags throughout the year. For information on sponsorship opportunities, contact Shelter House at sponsors@shelterhousenwfl.org.